So this is how it feels. The Philippine Football Peace Cup is modest at best; but when you go almost an entire century without anything that even approximates an international football title, then winning any championship trophy feels like winning the Jules Rimét. While in that century, Brazil brought home the real Jules Rimét no less than five times and the Italians four, for the Philippines most of the time avoiding defeat in an international match – no matter how humble – was already considered something of an achievement. This feels special not only because it is the first championship trophy after a long drought; but more because it is the promise of more to come. The match itself began at a frantic pace; and unlike Macau, Chinese-Taipei were prepared to press the Philippines and launch forays of their own. That they were well-beaten by the half was due in no small measure to two instances of suicidal defending and the quickness of the Filipinos to pounce. Winning the tournament with a young team and with its more established internationals not even involved, one sort of gets the feeling that it will not take another century for the next trophy to arrive. The Philippines tested Chinese-Taipei as early as the 1st minute after Demeterius Omphory went on a glorious run from the back to get into the danger area. He was unceremoniously upended; and from the freekick, Caligdong tested the goalkeeper with a shot straight at goal. The ball was firmly held by the latter, however. The breakthrough for the Philippines came not long after. Dennis Wolf, who missed a sitter after a neat interchange with teenager OJ Porteria in the 10th minute, was quickest to react after a goalmouth scramble from the resulting corner to score his fourth goal of the tournament. Wolf got at the end of a delightful searching pass from Matthew Uy just four minutes later, only to be let down by a poor first touch. Uy did well to create the chance, twisting around and leaving behind two Chinese-Taipei defenders before launching a precise 40-yard diagonal pass. Despite the early lead, it was not one-way traffic at all as Chinese-Taipei were themselves prepared to have a game of it. One foray required a timely intervention by center-back Jason de Jong while another, off a freekick from deep in midfield in the 25th minute, required Eduard Sacapaño to punch clear. The better chances, however, were still being created by the Philippines. Porteria did well to turn two Chinese-Taipei defenders in the 32nd minute and cut the ball back for Wolf to finish. The latter’s shot, however, lacked conviction. Just two minutes later, however, Caligdong gave the Philippines a two-goal cushion after a Chinese-Taipei defender gifted him with a chance from a horrific clearance. The Air Force player made no mistake from just top of the box. It could have been worse for Chinese-Taipei in the 40th minute after the lively Porteria got the ball into the net after being slipped through by Uy. The teenager, however, had drifted marginally offside and the goal was disallowed. 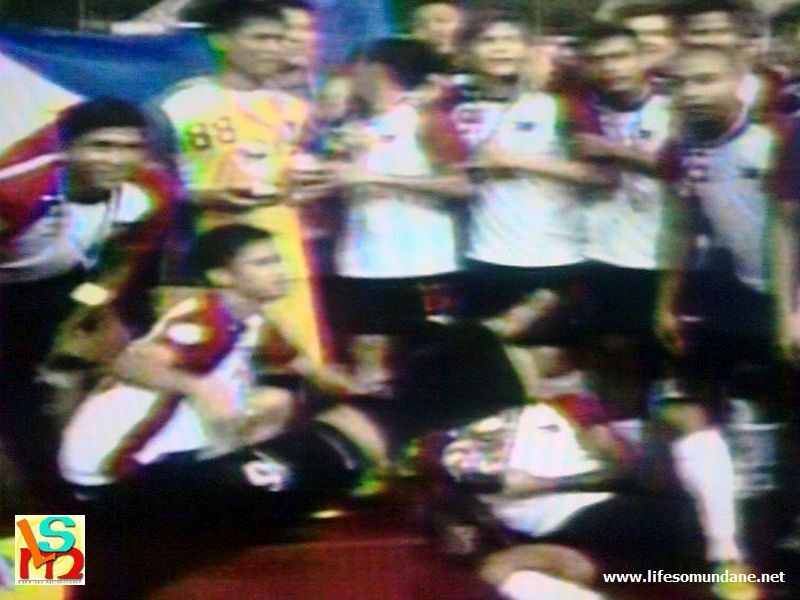 It took the teenager just two minutes more minutes to give the Philippines the luxury of a three-goal lead. Chinese-Taipei played another suicidal pass from defence; Porteria intercepted and slipped the ball under the goalkeeper for his first international goal. They do say that football is a game of two halves; and Chinese-Taipei returned to the pitch after the break with decidedly more conviction. The Philippines’ conceded its first goal in the 51st minute when a hopeful ball was pumped over the defence and should have been routine for Sacapaño. The Philippines’ number one spilled the shot, however, and Chang Han scored with the goal unprotected. 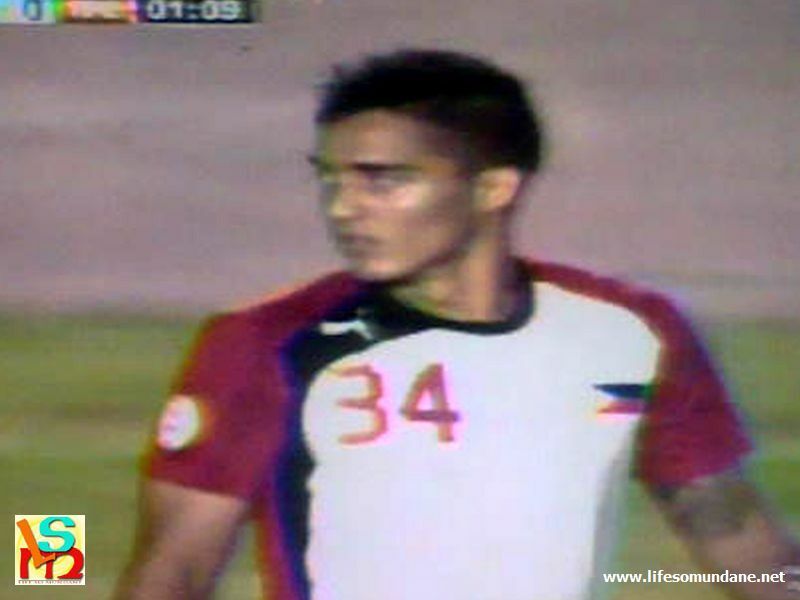 Wolf could have restored the Philippines’ 3-goal lead after being set up by Caligdong in the 57th minute. All he found, however, was the side netting. Moments earlier, Porteria was sent through on goal by Uy, only for the chance to be thwarted by a desperate last-ditch tackle. There was a brief commotion involving a Chinese-Taipei official who vehemently protested a non-call on an Omphroy tackle moments before the Wolf chance. It was never a penalty, in the first place; Omphroy’s sliding tackle was perfectly-timed. The lull seemed to have disturbed the Philippines’ concentration, as Chinese-Taipei started to gain more possession and won a freekick in a dangerous area in the 73rd minute. Sacapaño, however, was up to the task and punched clear. The Philippines were being forced to play on the break and Patrick Reichelt did well to break free down the right in the 78th minute. Wolf, who was arriving in the middle, however missed the low cross that Reichelt played. Chinese-Taipei almost got a chance to make things even trickier for the Philippines when Jason de Jong conceded a clear penalty in the 92nd minute. Sacapaño, however, preserved the two-goal cushion by saving with his legs. When the Vietnamese referee blew for full-time, the century long wait was finally over; and the Philippines had won its first international trophy since the Far Eastern Games title of 1913. The Philippine performance, perhaps, could have been more assured in the second half; and especially so with a 3-goal cushion. Still, the weight of an entire century is one hell of a burden for the Filipinos to have been carrying on their shoulders; so in the end, the manner of victory matters the least. Winning the tournament with a young team and with its more established internationals not even involved, one sort of gets the feeling that it will not take another century for the next trophy to arrive.